T.D. 1 was officially named by NHC on their 11pm edt advisory. We had hinted for several days that this region needed to be watched closely. Upper air winds are still favorable for further strengthening and the depression with likely be named Alma during the morning. 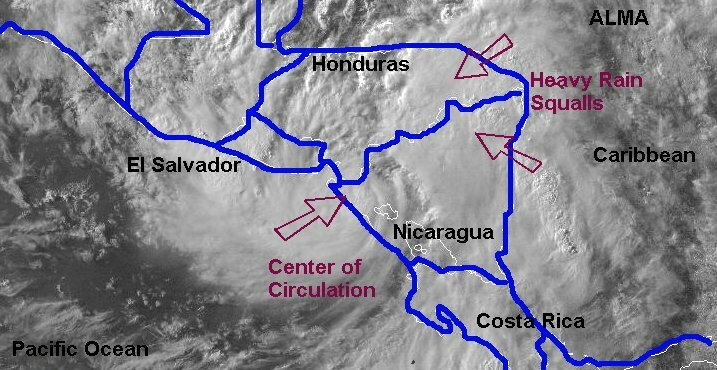 The center of circulation in centered near 10.5 N / 86.8 W or just offshore of the west coast of Costa Rica and Nicaragua. Deep convection has now bursted west of the center, so strengthening is likely. 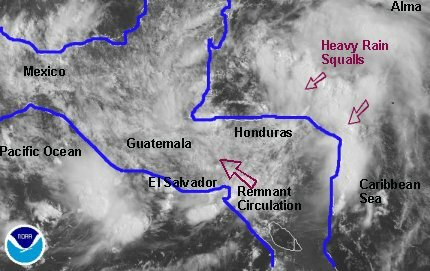 The main concern with be for very heavy rain from Costa Rica northward into Nicaragua, Honduras and El Salvador. The slow motion northward of the system will allow for heavy rainfall totals of 10-20 inches or more over the next several days. Last edited by Caribbean Traveler on Thu May 29, 2008 11:41 am, edited 1 time in total. Alma was upgraded to a tropical storm and now has top sustained winds of 65 mph. Motion is to the north at 7 mph. 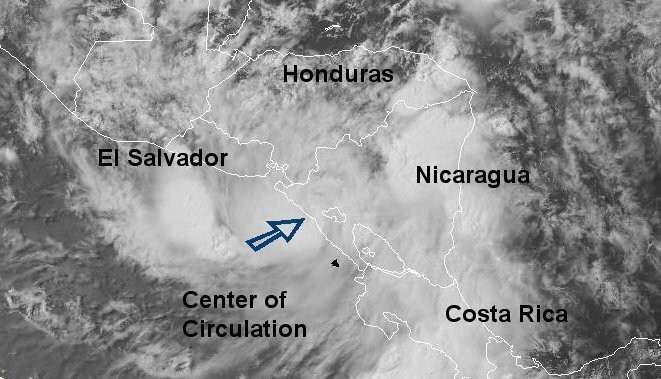 The center of circulation is just off the west coast of Nicaragua and will likely make landfall on the northwest coast or near the border with El Salvador this evening. 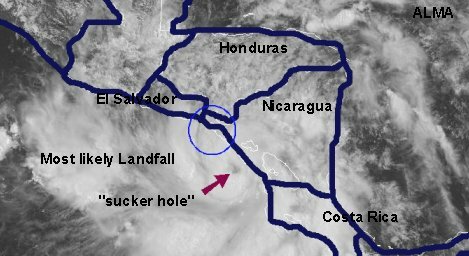 A "sucker hole" has developed near the center of circulation. This is not an eye feature. It is still possible that Alma will make hurricane strength before landfall and hurricane advisories have been posted for Nicaragua northward to El Salvador. Heavy rain will still be the main concern will amounts of 10-20 inches from Costa Rica northward toward Honduras. Alma is now making landfall on the northwest coast of Nicaragua. The heaviest squalls are offshore. The recent strengthening trend will stop this evening as Alma is now heading over land. A serious rainfall threat still exists for the next several days. Alma is on the northwest coast of Nicaragua and will be moving into southern Honduras and extreme southeastern El Salvador tonight into Friday. The system will disapate Friday, but flooding rain will remain a threat for several days. Watch for any regeneration in the western Caribbean next week.